Conspiracy theories aren't just a feature of the fringe. They've been a potent force across the political spectrum, at the center as well as the extremes, from the colonial era to the present. In The United States of Paranoia, Jesse Walker explores this rich history, arguing that conspiracy stories should be read not just as claims to be believed or debunked but as folklore. When a tale takes hold, it reveals something true about the anxieties and experiences of those who embrace it, even if the story says nothing true about the objects of the theory itself. In his talk, Walker will lay out five conspiracy narratives that keep recurring in American politics and popular culture. Jesse Walker is an editor at Reason magazine and the author of Rebels on the Air: An Alternative History of Radio in America. His articles have appeared in The New York Times, The Washington Post, The Wall Street Journal, and many other venues. He lives in Towson with his wife and two daughters. Mar 12 Drinking Skeptically, now in MD and VA! 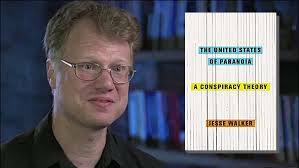 Apr 5 NCAS Lecture: Author Jesse Walker discusses his book, The United States of Paranoia: A Conspiracy Theory.